Youngstown Analysis: If you multiply the total number of opportunities of 1273 times the RPG average for the entire company of $136.17 you will see the true potential for this location of sales for this period of $173,344. Compared to $68,980. This is an increase of $104,364 or an increase of 151%. Don’t you wish you had this report a few years ago? Please notice that Store #1 has more traffic and a slightly lower Closing Ratio (5.08%) and a slightly lower Average Sale of (8.4%) or $42.44 per Transaction. 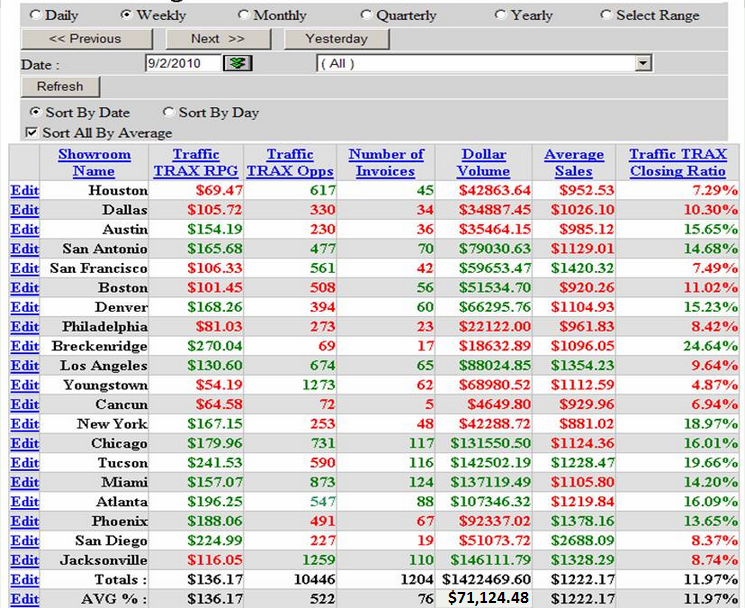 This is the monthly analysis of a Wireless Dealer to show the benefits of accurately measuring traffic counts. These are profit dollars for a single month. The bottom report is the most powerful. It represents a potential monthly loss for one store of over $14,000 per month on profit dollars. A friend of ours committed to counting his traffic. He had nine salespeople and was generating $600,000 per month in sales. I asked him before the count what he thought his closing ratio was. He immediately said between 35 and 40%. This is a very typical answer in our business. He even called in his sales manager and asked her the same question. I smiled when she said exactly the same thing. 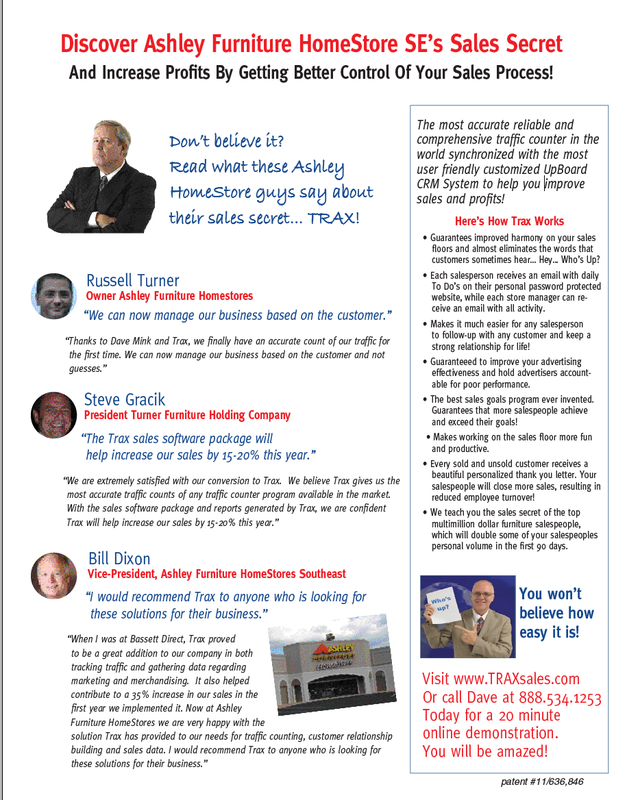 He called me and said Dave… I just realized that if I can somehow get my salespeople to sell three more customers per hundred I can increase my overall sales by 50%. He now has 15 salespeople and recently had a 1.2 million dollar month. That’s double folks…and interestingly if you do the math, each salesperson’s personal level of sales volume also improved. 3. 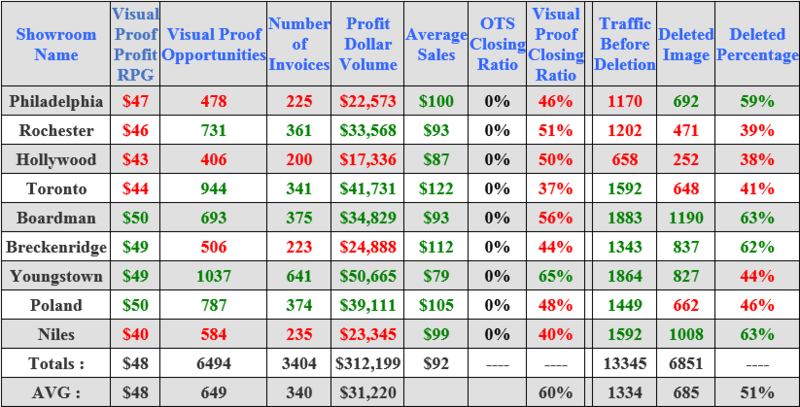 Comparison between the # of physical opportunities and those identified by your sales team. Revenue Per Guest (RPG) is the benchmark which provides a monetary assessment of your physical opportunities by drawing a comparison between the total sales dollars and the number of physical opportunities that visited the store. 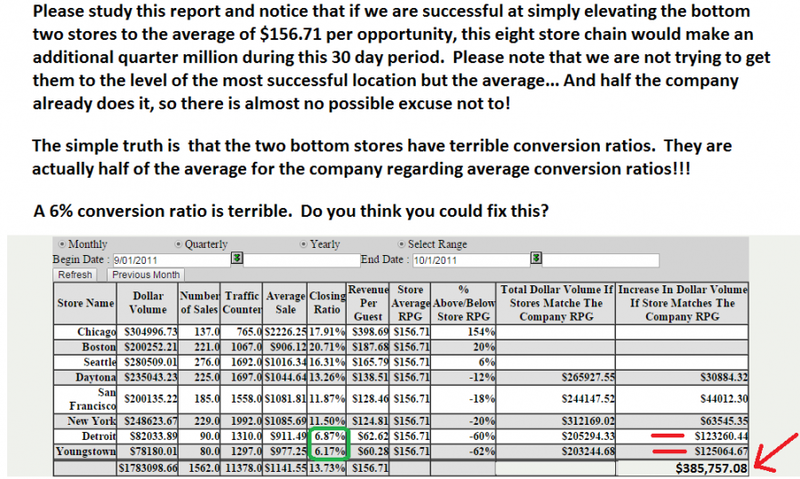 Since there are only two ways to improve the RPG which is by improving the closing ratios or the average sale ratios, you can now track this figure and know immediately if your business is improving or not. In other words if this showroom was able to change the Revenue Per Guest from $83.73 as shown in this example to $167.00 they will double their sales from $252,467 to over $500.000 Trust me, $167 RPG is not that difficult. Secondly, this report will provide an accurate measurement of your closing ratio based on the # of sales vs. the # of physical opportunities. Often times sales people estimate their closing ratio based on only prospects who they believe will close versus all opportunities. In order to fully understand the dynamics of your traffic, the benchmarks need to be initially focused on physical traffic counts. 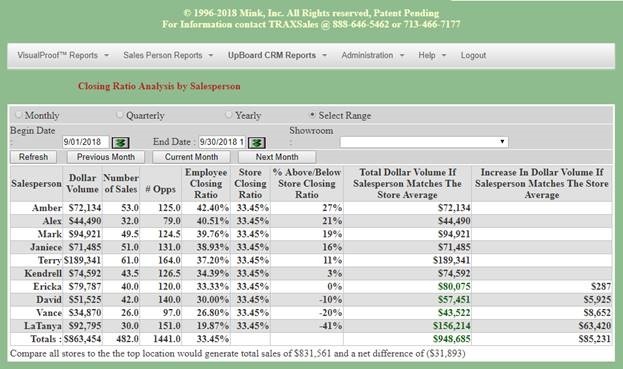 And lastly, by comparing the difference between the # of opportunities counted by the traffic counter and what the salespeople enter into the UpBoard, you now know how many opportunities are not being accounted for by your sales team. More importantly, you now know how many opportunities have slipped through your doors for which you do not have good follow up information for. Without good follow up information, you will not be able to “tap” your “unsold market” which ultimately limits being able to increase your Revenue per Guest (RPG) through increased sales derived from this untapped market. For example, the top line of this report show that 191 physical opportunities were counted by the door counter and only 43 were recorded, therefore 148 opportunities came in but are not accounted for. Imagine if you were able to close .07 of those customers now or in the near future by executing good follow up procedures, that would mean an additional 10 sales. Based on the average sales in this example, an additional $15,000 could potentially have been sold! Remember – accurate measurement by itself creates awareness and the opportunity for improvement, adding intelligent management compounds this improvement dramatically! 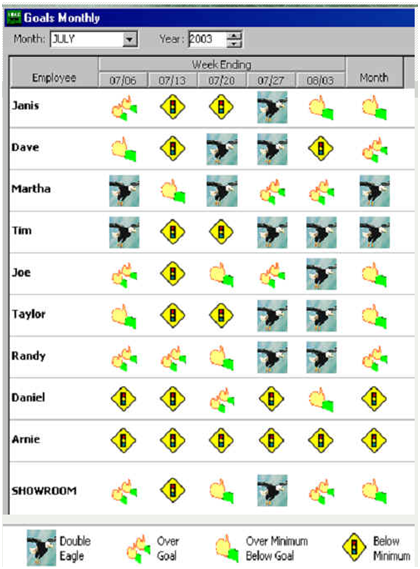 This report can also be sorted by day, so you can look at all of your Saturdays at a single glance.